The firm was started in 1917 by Edward Symes Bond who moved from Louth. Originally there were 3 shops but the ones in Woodford and Kettering were later sold, leaving the Thrapston shop where James’ newsagents is today. Their first house journal “The Vase” was printed in 1919 and this attracted advertising work from suppliers of a very popular breakfast cereal at the time, “Force”. 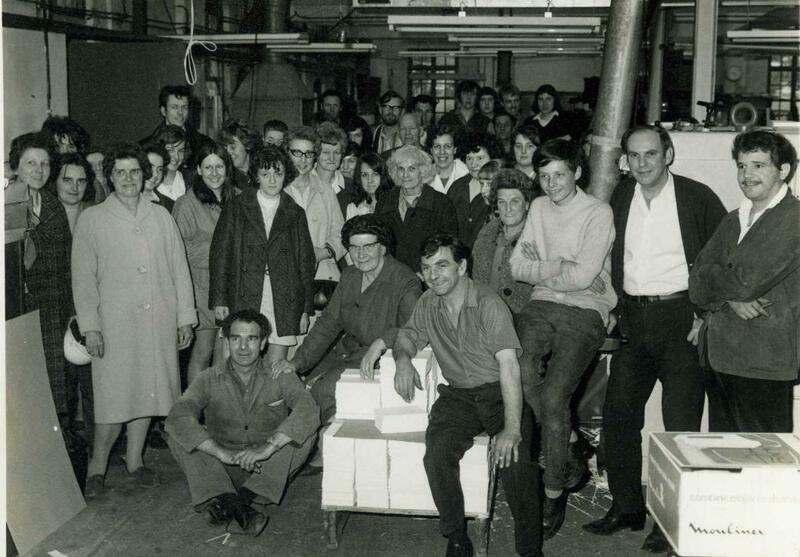 In 1922 the company moved to larger premises and the Vase Press came into being. In 1924 they acquired premises in London and letters were sent daily from Thrapston via train, arriving by mid-day, which was faster than the postal service. The works were extended in 1926 at the same time as “Force” started offering free gifts in their packaging which changed their printed advertising. Vase Press then specialised in printing House Journals with advertising coming from well-known household names. In 1939 Young men who had been trained up in the business were called for National Service and the Americans requisitioned half of the factory to store supplies for their hospital at Lilford Hall. After the War, men didn’t want to return; skilled workers and their families weren’t attracted to country towns such as Thrapston. The owners tried to sell the business as a going concern but eventually it went into voluntary liquidation. The premises and plant were sold separately. After the war, good machines were hard to come by so were much sought after. The premises were bought by Woolnough & Co. and they bound The Encyclopaedia Britannica together with high class Bibles. The new owners employed most of the Binding Room staff while jobs were found for most of the compositors and machine minders. 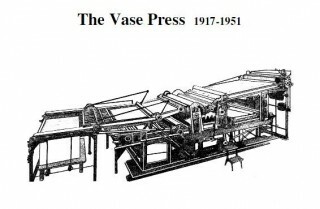 Finally, in 1951, the Vase Press ended trading. The firm was started in 1917 by Edward Symes Bond who had came to Thrapston from Louth. Initially he was in charge of the printing department of Taylor & Downs, newsagents, stationers and printers. They had 3 shops, one at Woodford, one in Kettering and the main one in Thrapston, which is where James’ newsagents are today. The printing department was part of the Thrapston premises. Mr Taylor then decided to split up the business, keeping on the Thrapston newsagents and selling the others. Mr Symes Bond bought the printing department and his brother, Mr J. Charles Bond bought the shop in Kettering High Street, which I believe is still known by his name, and the Woodford one was sold to Mr Arthur Pitts. In 1919 Herbert J. Bond joined his father and their first House Journal “The Vase” was issued. This was planned to attract orders from all parts of the country and was their only form of advertising. I suppose this was quite successful as it attracted all the advertising work from the suppliers of “Force”, the very popular breakfast cereal at the time. Their orders were so prolific it was thought that larger premises were needed and in 1922 a field in the Oundle Road was purchased from one of the local land owners of the time and the first part of the Vase Press was built. The “Force” work rather dominated the output and in 1924 an office was acquired in Great Portland St, London in the premises occupied by A.C.Franklin & Co., (the distributors of “Force”). In those days Thrapston had two railway stations and each day a letter was sent to London by train about 10-10.30 in the morning, arriving at Euston Station by mid-day. This letter contained proofs, instructions and various items needed by the London secretary – much quicker than by post at that time. In 1926 an extension to the works was built which unfortunately coincided with the change from printed advertising to the provision of free gifts in food packaging. “Force” was no exception. Their gifts included the “Sunny Jim” rag doll, jigsaw puzzles and Force model planes invented by Mr Wallace Rigby and which the Vase Press were fortunate to print and produce. However Mr A.C. Finken and his son, Burleigh Wilson Finken were still very interested in the firm and they became directors, together with Mr Percy Wallis, of Wallis & Linnell, clothing manufacturers of Kettering. Work had to be found to replace that lost to free gifts and the Vase Press then specialised in printing House Journals. Their work was not local but came from London and from advertising agencies, many orders coming from well-known household names. Not only were the Journals printed in Thrapston, but also mailed from there, which proved very popular with the Kettering Post Office who sent sorters out to Thrapston to put mailing lists to firms such as Penguin Books, Omega Watch Company, Smith and Grace etc., into their proper postal districts. Then in 1939 came the war and the young men, mostly from local villages and trained in the business, were called up into H.M. Forces. This left only a skeleton staff to carry on, which they did, doing any of the work when needed. When the Americans joined in the hostilities they requisitioned half of the Oundle Road premises to warehouse supplies for their hospital at Lilford Hall. The family worked all hours to get the work out on time and were looking forward to re-engaging the boys whose jobs had been kept available for them. In the event, after the war was over, they did not wish to come back – most of them had got used to the outdoor life and wanted open air jobs. The trade generally was short of many thousands of skilled workers and it was very difficult to attract them to a country town. If they themselves did not mind, their wives did – they wanted larger towns and cities. So it seemed that we had two alternatives: one was to carry on working all hours to keep the plant going; the other was to try to sell the business as a going concern. We tried the latter only to be told that if we couldn’t run it on a reduced staff, no one else could. We tried for a whole year to sell it and after that we went into voluntary liquidation. The premises and plant were sold separately. A firm of printing auctioneers came down from London to sell the plant and buyers came from all over England. At that time just after the war good machines were very hard to find and all the machines were in very good condition, so they were much sought after. The premises were sold to Messrs Woolnough & Co., who bound the Encyclopaedia Britannica and also high class Bibles. Woolnough & Co., were happy to employ most, if not all, of the binding room staff and jobs were found for the rest of the compositors and machine minders. 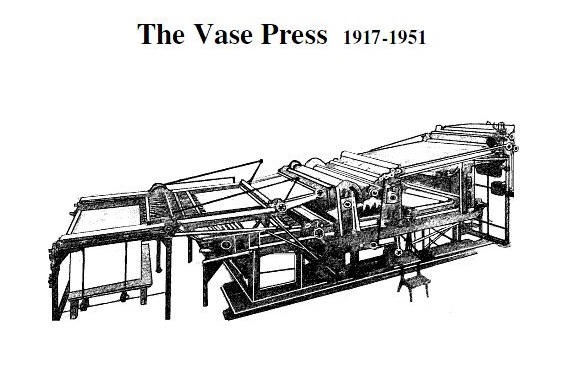 So in 1951 the Vase Press ended trading as quality printers. This page was added on 22/10/2014.